This is the terrifying moment a shark came crashing into a diving cage – with someone trapped inside. The diver miraculously escaped uninjured. The incident happened during a diving trip near Guadalupe Island, off the coast of Mexico. 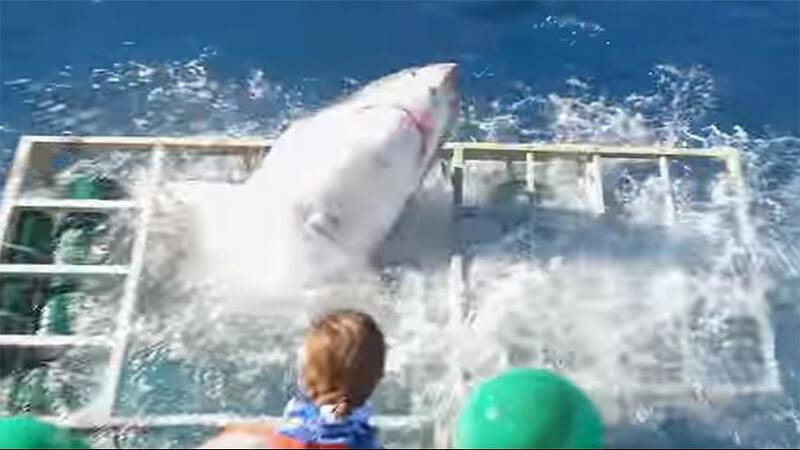 It was posted to YouTube by user Gabe and Garrett, who later sought to play down the incident: “What might appear to be an aggressive great white shark trying to attack the cage, this is not the case. “These awesome sharks are biting at large chunks of tuna tied to a rope. When a great white shark lunges and bites something, it is temporarily blinded. They also cannot swim backwards. “So this shark lunged at the bait, accidentally hit the side of the cage, was most likely confused and not able to swim backwards, it thrust forward and broke the metal rail of the cage. “There was a single diver inside the cage. He ended up outside the bottom of the cage, looking down on two great white sharks. The diver is a very experienced dive instructor, remained calm, and when the shark thrashed back outside the cage, the diver calmly swam back up and climbed out completely uninjured.